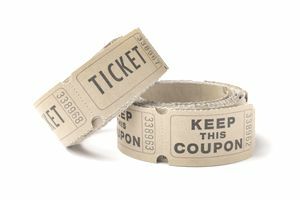 If you are planning a raffle for your community organization or charitable group, you have a conundrum: You want to offer prizes that are attractive enough that people want to buy tickets, but inexpensive enough that your organization keeps a good share of the raffle’s profits. Here are some affordable raffle prize ideas that help you offer great prizes for a low cost. Before you start trying to gather prizes for your raffle, think about your audience. Who is going to be buying the tickets? It doesn’t matter how great or expensive the prizes you have are, if they don’t appeal to your audience, your raffle is going to flop. So make a profile of the people who are going to be at your event. Are they parents? Kids? Outdoor enthusiasts? Science fiction fans? Men or women? Older or younger? Where do they shop? What do they do in their free time? Armed with this knowledge, you can tailor your prizes to be as successful as possible. When you speak to potential donors, you can steer them in the right direction. You can also turn down any donations that are inappropriate for your audience. While any donation is generous, items that your audience won’t appreciate waste time and resources, and can even make your raffle more expensive. Local businesses are a great place to start looking for raffle prizes at the best possible price–free. A thank-you wall where you post the logos of your prize donors. Free advertising in the organization's event flyers or church bulletins. A thank-you letter that the company can post in their place of business, showing their generosity. Businesses can donate gift cards, branded toys, gift baskets, tickets, or their own products. Some companies to invite to donate include restaurants, ice cream shops, grocery stores, theaters, pizza delivery companies, and attractions. Many small businesses are happy to help a good cause in their community; larger businesses may have procedures set up to request donations. Another idea to source great, free or low-cost raffle prizes is to ask your members what they can donate. This doesn’t necessarily mean just money or items, but perhaps their special talents as well. For example, a member who is an artist can offer a fun class for adults or for kids. A teacher could offer tutoring sessions, while a teenager could donate a few hours of lawnmowing or snow shoveling. These kinds of donations can be more attractive than physical products. A low-cost way to provide great raffle prizes is to have the members of your organization create prizes by hand. You want to avoid anything kitschy or cheap, but that still leaves a lot of options open to you. For example, you can make attractive-looking recipes in a jar, or mix up DIY body scrubs and bath bombs and make a luxurious gift basket from them. You could make a cookie or other baked goods tray, and talented members can knit scarves or make a teacup candle. For the price of ingredients, you can come up with a large variety of DIY raffle prizes. Another idea to save money on your raffle prizes is to buy small prizes in bulk and gather them together into baskets or gift bags. This is especially easy to do if kids or their parents will be participating in your raffle. Party supply companies like Oriental Trading or wholesalers like Alibaba are good for this kind of raffle prize. You may also have luck at warehouse stores like Big Lots or Costco. Check out dozens of raffle prizes on Pinterest. Fundraiser Alley has an overview of the most popular raffle prizes. Shutterfly has a list of classy DIY gifts that you can adapt for prizes.